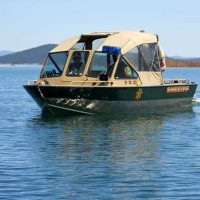 (From Deschutes Sheriff’s Office) – The Deschutes County Sheriff’s Office Marine Unit is pleased to announce the return of our free Mandatory Boater Education training classes as well as a pre-season opportunity to have your motorized boat inspected. Oregon law requires Oregon residents 12 years of age and older who operate powered boats of more than 10 hp, to obtain their Mandatory Boater Education card. Failure to have a card under the above conditions might result in a $110 fine. This card is not a license to operate a boat, as there is no such requirement in Oregon. Once a boater receives their card, it never has to be renewed. There is a one-time $10 cost to receive your card and duplicate cards are available for $5. Boat operators can also access the testing material and take the test on-line through the Oregon State Marine Board website, but there is generally a fee associated with the test and receiving a certificate. The Deschutes County Sheriff’s Office offers four, three hour classes free of charge that accomplishes the same goal. Students watch a video, are given information pertaining to specific Oregon laws and requirements and have the opportunity to ask questions. Students then take a 75 question multiple choice test; a minimum score of 70% is needed to pass. The tests are graded at the class and once a student has passed, they receive all necessary paperwork and information on how to receive their card from the Oregon State Marine Board. The following is the schedule of classes for 2019. All classes run from 6pm-9pm and are held at the Deschutes County Sheriff’s Office in Bend (63333 Hwy 20 West). There is no sign up or registration for the class, but please arrive a few minutes prior to the start of the class to check in. For additional information, go to www.sheriff.deschutes.org, or www.boatoregon.com or contact the Sheriff’s Office at 541-388-6501. Classes will be held on: May 10th, June 14th and August 9th. The Deschutes County Sheriff’s Office will also be providing an opportunity for boaters to have their boats inspected at three different locations in Deschutes County. The inspections will be offered Saturday, April 13th, 2019, at Big Country RV in Redmond, Sportsman’s Warehouse in Bend and the Deschutes County Sheriff’s Office substation in La Pine. DCSO Marine Deputies and Volunteers will be present at the above locations on April 13th, between the hours of 9am-3pm.